This week our vet clinic, Medi-Vet, organized a different sort of customer event. Instead of the lecture evenings they have held before, with animal-related topics, this time they arranged a special screening of the documentary film An Inconvenient Sequel: Truth to Power. 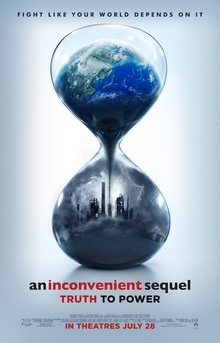 The film addresses the issue of climate change, focusing on the lead-up to the Paris Climate Agreement signed in 2016. I haven't seen the 2006 film An Inconvenient Truth, and I was expecting this film to present further evidence for human-caused climate change. It did some of that, but mainly focused on Al Gore and his efforts to educate about climate change and influence policy. While Mr. Gore is obviously sincere and committed to his cause, and could be considered a hero, I find hero-worship and personality cults distasteful and sometimes counterproductive, and would have preferred to see a bit less of this aspect. Climate change has its opponents, who deny that it's happening at all, or deny that human activity has had any impact on the climate. These deniers seek to discredit the scientific proof. It seems that their reasons for this are disingenuous. In some cases these people have a vested interest in the polluting industries, while others consider it hubris to believe that humans could have such a profound influence, sometimes due to their religious beliefs that place humans as subordinate to deities. However, the scientific consensus is unanimous, and choosing to reject and ignore it seems much more hubristic than accepting it and trying to mitigate the self-evident problem before it gets worse. Also, many of the climate deniers have an ideological opposition to any government regulation, seeing it as a restriction of industry's freedom. But when the choice is between granting companies the freedom to make the world a worse place for the current population and for future generations in the name of short-term profit, and forcing them to do the right thing and care about humanity and our planet, I think regulation seems to be absolutely justified. The film presented one of the ethical dilemmas facing the struggle for clean energy. Before and during the Paris Climate talks, the Indian government argued that in order to bring India (and other third world countries) out of poverty and into prosperity, they would have to use the tried and tested fossil fuel economy rather than the new renewable energy model. They argued that western developed countries had used fossil fuels for 150 years, and that the third world should be given a chance to catch up instead of being accused of polluting the planet. This is a flawed argument. Once you know that something is bad, you stop using it no matter what its benefits might be. One could similarly argue that some of the US economy's early progress was based on slavery, and therefore other countries should be allowed to use slavery to catch up. In all ethical arguments, justice lies on the side of what benefits the community as a whole. In this case, the community is the entire human race and the whole planet. The problem is that the issue is being addressed on a country level and the human race has yet to achieve the cohesion required for a global consensus. I would have expected the whole of humanity to unite in the face of this global threat, but instead we still see governments thinking in narrow national terms. I hope this sort of thinking will change. The film showed how Al Gore was instrumental in getting India to sign the Paris Climate Agreement. He achieved this by obtaining favourable conditions for the construction of solar power facilities in India instead of the polluting fossil fuel power plants that India had been intending to construct. Ultimately, the use of renewable energy is a win-win situation. It does create jobs and does contribute to economic growth, despite what the deniers argue. It is particularly suited to third world countries, where there is a lot of sunshine and wind that can be converted into clean energy. And, as the film pointed out, installing renewable energy in third world countries is similar to the "leapfrogging" effect of third world countries adopting cellular phone technology instead of emulating the past path of western development by starting with land-line phones. As the film drew to a close, we all knew what was coming. After the hope inspired by the Paris Climate Agreement came the disappointment of President Trump's decision to withdraw the US from it. It seems that progress is always two steps forward, one step back. This short-sighted ideological stupidity, which is either incredibly ignorant or incredibly malicious (or both) will have a devastating effect on the planet we all share. We can only hope that this withdrawal will be short lived, and that the next US administration will do what it can to redress the balance. In the meantime, individuals, companies, and governments should do what they can to reduce their carbon footprints and contribute to educating the public on the importance of science and progress. This was a thought-provoking film, and I'm grateful for the opportunity to watch it and think about the issues it raised.